Account Notification Webhooks allow you to receive notifications regarding activity in your account via an HTTP POST to an external URL. Webhooks are typically used by developers to register endpoints that will be notified when activities of their choosing take place. This allows for a more seamless integration with SurveyGizmo that limits the need for repetitive polling of the API. If you are looking to use Webhooks to send data to and from surveys visit our Survey Webhooks documentation. We recommend testing these notifications before you start sending data to your production endpoints. To set up an Account Notification Webhook go to Account > Integrations > Webhooks. Enter your endpoint URL in the field below the notification/s you wish to receive. Review details of the data posted in each webhook type below. Survey Create - The survey-create notification will post to the endpoint you specify when surveys are created. This includes newly created surveys, as well as, copied surveys created via the user interface or the API. See the below table for specifics about the data. Survey Update - The survey-update notification will post to the endpoint you specify when surveys are updated. This includes the creation of or edits to questions, pages, actions, media elements, or translations made via the user interface or the API. See the below table for specifics about the data. 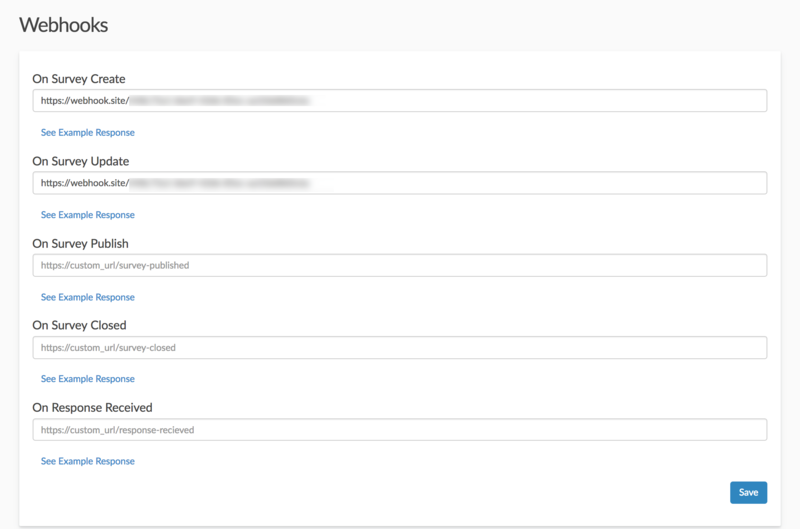 Survey Publish - The survey-publish notification will post to the endpoint you specify when share methods (link, email campaign, etc.) are created via the user interface or the API. The default survey share link is created when a user navigates to the share tab, which will fire the survey publish notification. See the below table for specifics about the data. Survey Close - The survey-close notification will post to the endpoint you specify when a survey's status is changed to Closed. See the below table for specifics about the data. The response received notification will post to the endpoint you specify when a completed or disqualified response is recorded via either normal survey taking or the API. See the below table for specifics about the data. *Present only if share method is an Email Campaign. If you wish to get real-time response data you can access survey data immediately without waiting for response processing with just two pieces of information: 1) the survey link and 2) the session ID. The survey link portion of the constructed link is the share link that was used to collect the response. For email campaigns this will be the base link as provided under the Advanced Settings section of the email campaign. The JSON will return the entire survey runtime object. In the below example JSON we highlight the portions of the JSON that allow you to access survey question data. There are a number of third-party tools available for testing your Webhook, including Webhook Tester and Mockbin. We have highlighted testing with Webhook Tester below. Go to the following link: https://webhook.site/#/. A unique URL will be automatically generated for you when you enter the site. Click the copy button to the upper right to copy your unique testing URL to your clipboard. Note: Do not use the link in the image, it is a unique link that was created for our particular instance, it will not work for you. Go to your Account Webhooks via Account > Integrations > Webhooks. 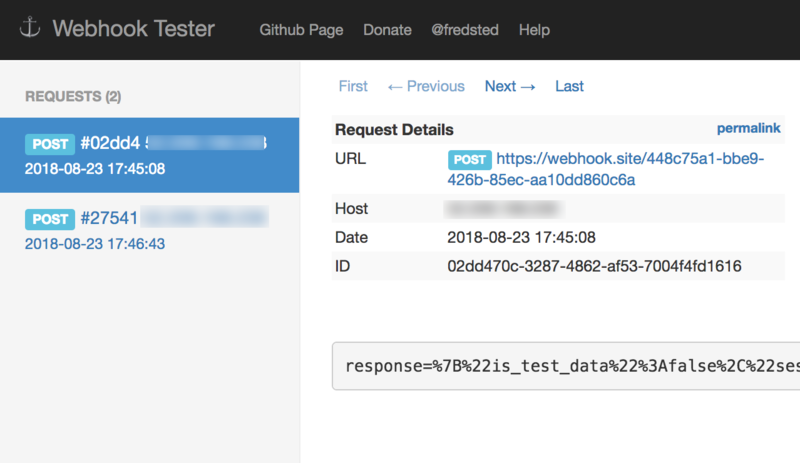 Paste your unique Webhook Tester URL into the Account Webhook that you want to test. Save your Webhooks and perform one of the associated tasks to trigger the Webhook. For example, to test the On Survey Create webhook, create a survey. To view the results that get posted, return to Webhook Tester. Each time a new response is submitted it will appear in your request list in the left menu. Click it to review the request details. How will Account Webhooks work in Master/Sub Accounts? Account Webhooks are only available at an account level. So, Account Webhooks set up in a master account will only send notifications regarding activity in the master account. If you wish to receive notifications of activity in your sub accounts you can log in to your sub accounts and set up AccountWebhooks there to do so.